The ceremonial groundbreaking for the Elliot Park Soccer Field was today. A friend who works at North Central University forwarded the following message that was sent to all faculty and staff at the University last week. From the image, it looks like the larger soccer field option was chosen which will remove the tennis courts and relocate the skate park. 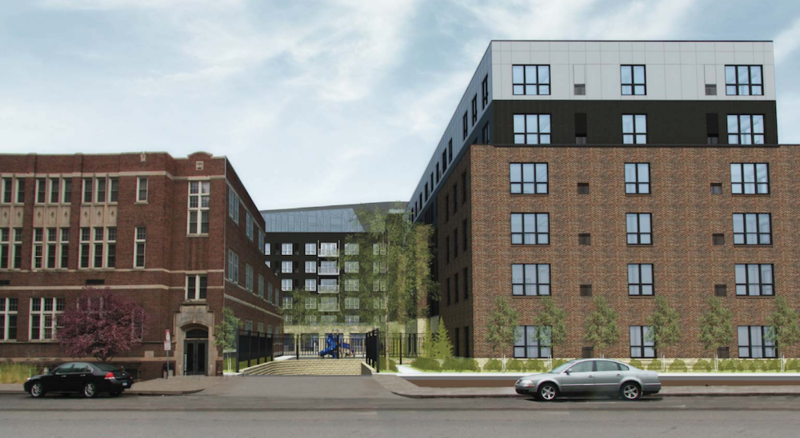 From what I can gather, North Central University is paying for a good portion of the development cost, but the Minneapolis Park Board is picking up the remaining cost. I do not know if the university will host any games at the field, but they will most likely use it for practice throughout their soccer season. All faculty and staff are invited to attend the groundbreaking for our brand new soccer field right here on campus. The ceremony will take place across the street from Miller Hall in Elliot Park this Wednesday, September 17, from noon to 1 p.m.
Several city officials and representatives from the Minnesota Park and Recreation Board will be in attendance. This is an exciting time for our athletics program and for the University as a whole. Let's come out and show our support! Huh, I live a block away and didnt even know this was happening. Seems like it should be an improvement over the run-down tennis courts, but doesnt that also leave a lack of places to play tennis in dte? Where is the next closest court? Looks like a number of mature trees are going to get pulled down for this along Elliot Avenue. Maybe more problematic, this is an awful lot of formerly public space that presumably will become semi-privatized. mplser wrote: doesnt that also leave a lack of places to play tennis in dte? Where is the next closest court? Loring Park, but I don't know that tennis is really popular enough that there really need to be courts in every single neighborhood. The tennis courts don't really get used much. When they do, it's typically students from North Central University in the spring and fall. I wouldn't say that that most of the soccer field's use would be privatized. The soccer schedule for the school runs from mid-August until the end of September. With men's and women's practices, North Central University would be using the field for less than 20 hours a week for those two months. The rest of the time, it would be open to the community. If you ever pass by Elliot Park in the summer, you'll know that the Somali community uses the open space as a soccer field nearly ever day. This will be a huge benefit as they will have a regulation size field to play on that doesn't dip and slant along the edges. There's experience in other parks that when these fields get improved (especially if it's with artificial turf), that the park board more aggressively schedules and rents them out, meaning that they're not open to casual pick-up games (to say nothing of people who just want to use a park, rather than playing soccer). 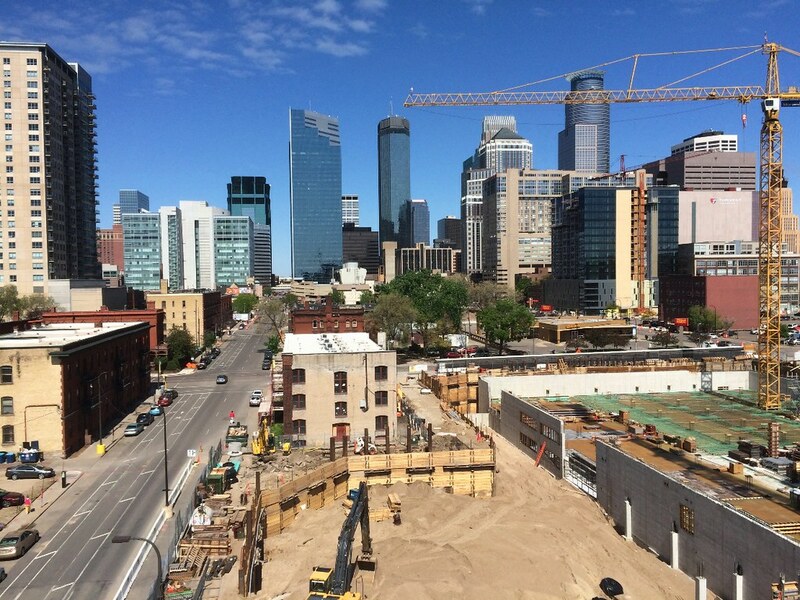 Great view showing the HCMC expansion, Portland tower, and Kraus-Anderson lot with a gorgeous skyline view too. 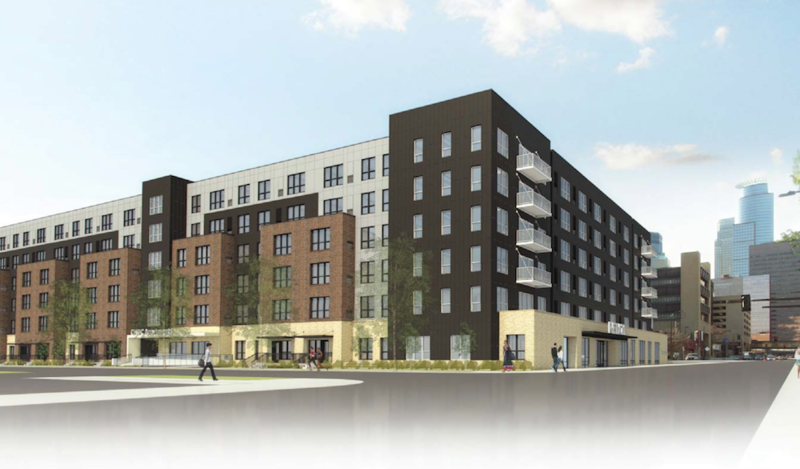 CHDC, Ryan, and First Covenant Church are proposing a new 6-story, mixed use building with 154 affordable housing units, 12,000 SF of retail, and 188 parking spaces. This will be submitted as a PUD. Edit: yes this is the one discussed over in Downtown Minneapolis General Topics. Seems deserving of its own thread. 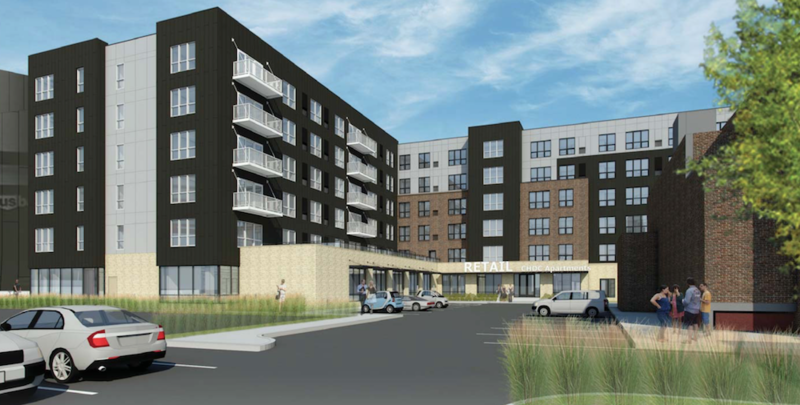 The 50 above-ground spaces aren't ideal, but hopefully that can get filled in over time facing Chicago Ave. That would depend on the Hubert's corner redevelopment (separate parcel) and obviously a different mobility/parking climate. The "bolt-on" structure should be one floor, not two (the brick should go up five floors before the stepback). The window layout on the upper floors should be different than the lower floors to break up the vertical layout of it. And there should be some sort of architectural detail to cap off the brick at the stepback. I was mainly referencing the south/ 7th st facade. Clearing it's being treated as secondary. Needs a little tweaking in 2 more window rows. They should make the brick redder, as a nod to the church's distinctive bright red facade. That alone would make a huge difference. So much black siding. Along with the black siding of USB stadium, that block of 6th will feel like you walking on the side of the Death Star. Hopefully, the city can push for more brick. Well that answers our question of what "The Aberdeen" is. Looks terrible. Please, to any architects out there. Stop using SketchUp as your source of perspectives for city files. It just makes your project look way worse than it may be. I don't think it looks terrible at all. I think it uses it's space a little awkwardly, but has decent material usage and fairly good urban form. Not amazing but definitely not terrible. Also happy to see that the brut behind this hasn't been slated to go, it's had a weird renovation but it's such a cool building. Remove the bulky "cornice" piece and we might be getting somewhere. Take the brick all the way up to the top and let it form into the cornice piece. Rethink the awning piece. It looks strange to wrap it around 3/4 of the structure. Let the ground floor units actually access the street from their units. Those are my first thoughts. The parking garage entrance seems out of scale too. I think it can improve, but right now it looks very... Early 2000s. 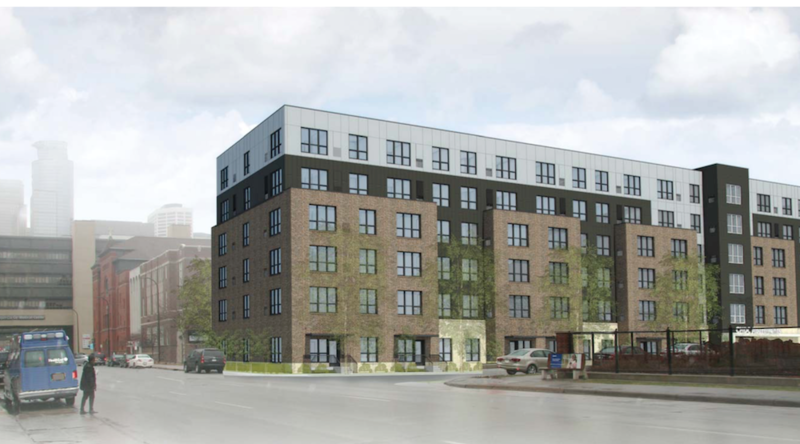 I like the infill (the design doesn't bother me a ton -- it's a smallish site), but I'm not a huge fan of the surface parking they're adding, and I'm surprised it's even allowed.